But unlike the IDF’s senior leadership, the public believed that the fact that it was B’Tselem that produced the film meant that it had to be viewed with a grain of salt. 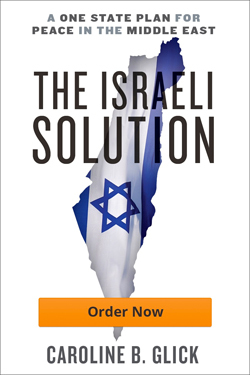 The name “B’Tselem” was seared into the public’s consciousness as an organization hostile to Israel and dedicated to causing it harm with the publication of the UN’s Goldstone Commission Report in 2009. Among the Israeli-registered groups that provided materials to the biased UN commission charged with finding Israel guilty of war crimes during the course of Operation Cast Lead against Hamas in late 2008 and early 2009, B’Tselem made the greatest contribution. The Goldstone Report cited B’Tselem as the source for its slanderous “findings” 56 times. After the UN published the Goldstone Report, Michael Posner, the US assistant secretary of state for human rights, visited Israel and met with Jessica Montell, B’Tselem’s executive director at the time. The US Embassy’s official report of their meeting was published by WikiLeaks. During their meeting, Montell told Posner that her group’s goal in providing the Goldstone Commission with materials was to force the government to pay a heavy price for its decision to fight Hamas, by criminalizing Israel in the court of world opinion. Montell explained that from B’Tselem’s perspective the root of the problem with Israel is the Israeli public. The public is the source of Israel’s bad behavior, according to B’Tselem, because it “had zero tolerance for IDF killed.” As far as the public is concerned, she said, harm to Palestinian civilians is preferable to harm to IDF soldiers. Since, in B’Tselem’s view, the public’s commitment to the lives of its soldiers meant that it would not constitute a “moral check on war,” and check the bellicosity of IDF commanders, it fell to B’Tselem to make the IDF brass and the government care more about world opinion than they care about what the public thinks. The public’s condemnation of B’Tselem after its role in compiling the Goldstone Commission’s libelous accusations against the IDF was made public made no impression whatsoever on the group. Following Operation Protective Edge in 2014, B’Tselem’s materials were cited 67 times by the report of the biased UN commission put together to slander Israel. The camera initiative involved providing video cameras to B’Tselem employees and volunteers in Judea and Samaria in order to document the actions of Israeli security forces and civilians in the areas. In many cases, the videos B’Tselem produced distorted reality for the purpose of criminalizing both groups. For instance, in 2011, B’Tselem gave a film to Ynet’s Elior Cohen that purported to show Israeli police brutally arresting a young Palestinian boy and preventing his mother from coming to the police station with him. But as CAMERA showed at the time, B’Tselem’s portrayal of events was fanciful at best. In all likelihood, the event was staged by the B’Tselem photographer. At the outset of the film the boy is unseen as he throws rocks at a police van. The boy is first seen as he runs toward the B’Tselem camerawoman. For her part, the camerawoman screams at the police and identifies herself as from B’Tselem. The police are shown asking the boy’s mother repeatedly to join them in the car. As she stands poised to enter the vehicle, a Palestinian man is shown telling her in Arabic not to go. In July 2016, B’Tselem released a film taken in Hebron during an attempted stabbing attack by a female Palestinian terrorist against Israel police at a security checkpoint outside the Cave of the Patriarchs. The police reported that the terrorist tried to stab a policewoman who was checking her in an inspection room. Another policewoman shot and killed her. B’Tselem claimed that its film proved that the female terrorist was shot for no reason. But the fact is that it does no such thing. As NGO Monitor noted, the B’Tselem film neither contradicts nor proves the police’s version of events. Over the years, the public’s growing awareness of B’Tselem’s unwavering hostility went hand in hand with its growing distress over what was perceived as the IDF’s willingness to sacrifice the safety of troops to prevent it from receiving bad press. For instance, in 2012, a film went viral on social media that showed a platoon of combat engineers fleeing from a mob of Palestinians attacking with rocks, Molotov cocktails and slingshots. When questioned by reporters, the soldiers said that they had repeatedly asked their battalion commander for permission to use force to disperse the crowd and they were repeatedly denied permission. Retreat was their only option. In 2015, another film went viral showing a group of Palestinian women hitting and screaming at a soldier trying to arrest one of them for throwing rocks at his platoon. He did nothing as he absorbed the blows. And no harm came to the women who assaulted him. Along with the films, came stories that soldiers on leave told their friends and family about the IDF’s rules of engagement. The tales were always the same. The rules of engagement are so restrictive that all initiative is placed in the hands of the enemy. Not only can terrorists attack at will. They can flee afterward and expect that no harm will come to them, because what is most important, the soldiers explain, is to ensure that IDF maintains its reputation as the most moral army in the world. This was the context in which Azaria killed the wounded terrorist. Although the headlines relate to Azaria, and his family members have become familiar faces on the news, the fact is the reason the Azaria affair was the biggest story of the year is that it really has very little to do with him. There are three forces driving the story. First of course, there is B’Tselem. B’Tselem’s produced the film to advance its goal of obliging Israel’s national leadership, including the IDF brass, to care more about “world opinion” than about the opinion of Israeli citizens. Second then, is the pubic that cares more about the lives of IDF soldiers than about what the world thinks of it. Finally, there is the IDF General Staff that is being forced to pick which side it stands with. Since Israel was established nearly 70 years ago, the relationship between the IDF and the public has been based on an often unstated social contract. From the public’s side, Israel’s citizens agree to serve in the IDF and risk their lives in its service. Moreover, they agree to allow their children to serve in the military and to be placed in harm’s way. From the IDF’s side, the commanders agree to view the lives of their soldiers as sacrosanct, and certainly as more precious than the lives of the enemy and the enemies’ society. The third side is the General Staff. In the years leading up to the Azaria affair the generals were already showing disturbing signs of forgetting their contract with the public. The films of fleeing soldiers and the rules of engagement weren’t the only signs of our military leadership’s estrangement. There were also the promotions given to radical lawyers to serve in key positions in the Military Advocate-General’s unit, and the red carpet treatment given to radical leftist groups like B’Tselem that were dedicated to criminalizing soldiers and commanders. Since the shooting in Hebron, the General Staff’s treatment of the public has become even more disdainful. Ya’alon and Eisenkot and his generals have repeatedly offended the public with comparisons of “IDF values” with alleged processes of barbarization, Nazification and ISIS-ization of the public by the likes of Azaria and his supporters. If there was a specific moment where the military brass abandoned its compact with society once and for all, it came on Tuesday, the day before the military court convicted Azaria of manslaughter. In a speech that day, Eisenkot insisted that IDF soldiers are not “our children.” They are grownups and they are required to obey the orders they receive. By making this statement the day before the verdict in a case that pitted society against the General Staff, which sided with B’Tselem, Eisenkot told us that the General Staff no longer feels itself obligated by a sacred compact with the people of Israel. Azaria is the first victim of a General Staff that has decided to cease serving as the people’s army and serve instead as B’Tselem’s army. The call now spreading through the Knesset for Azaria to receive a presidential pardon, while certainly reasonable and desirable, will likely fail to bring about his freedom. For a pardon request to reach President Reuven Rivlin’s desk, it first needs to be stamped by Eisenkot. A pardon for Azaria would go some way toward repairing the damage the General Staff has done to its relationship with the public. But from Eisenkot’s behavior this week, it is apparent that he feels no need and has no interest in repairing that damage. As a result, it is likely that Azaria will spend years behind bars for killing the enemy. Moreover, if nothing forces Eisenkot and his generals to their senses, Azaria will neither be the last nor the greatest victim of their betrayal of the public’s trust.